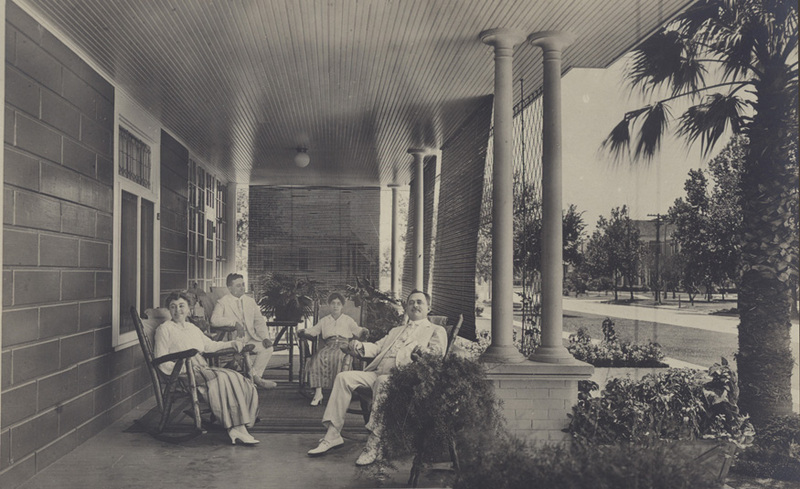 Image: Brothers Henry and Grover Staiti with their wives, sisters Odelia and Leah Reisner, on the front porch of the Staiti house ca. 1918. The Staiti House, built as a speculative home in the Westmoreland Addition, was purchased by oil pioneer Henry T. Staiti in 1905. After damage from a hurricane in 1915, the house was renovated and expanded by Alfred Finn's architectural firm. The house included several modern amenities, including early electric lighting, an intercom system, a built-in ice box, and a sprinkler system in the professionally landscaped garden. It was used often for large family gatherings, and several extended family members lived or stayed long-term in the house. The narrow door in the kitchen leads to a small service stairway. The Staiti House was moved into Sam Houston Park in 1986. It is furnished to depict the lifestyle of the Staiti family in the early 20th century. When architect Alfred Finn designed an addition to the house in 1915, he added BOOKCASES with his signature chevron design. See the map below for the original location of the Staiti House at 421 Westmoreland.